A picture with a thousand stories. A travel with a thousand pictures. Here’s a sight some of you might be horrified at. 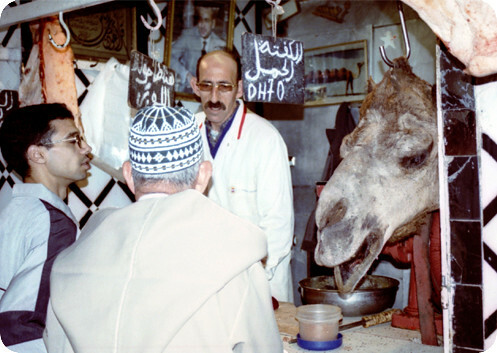 I certainly hadn’t seen a camel’s head hanging at the butcher shop before. It has a Mona Lisa-ish expression that is very difficult to decipher. This picture was taken at a market stall in Meknès, Morocco. And if you thought coming face to face with the animal you were about to devour for lunch was bad, it’s quite normal to leave meat outside without refrigeration for hours on end at these markets.